WHEN: Sunday, May 21, opening reception from 2 to 4 p.m.
We'll celebrate these new shows with gallery talks featuring several of the artists. Refreshments will be served. Learn more about these new shows below. Concrete, drywall, PVC pipes, wire, milk crates. You’d fully expect to see these and similar materials at a construction site but not in an art museum. But the Hunterdon Art Museum’s latest exhibition The Art of Construction encourages viewers to see how common building materials can be bent, twisted and shaped to create intriguing works of art. Lovina Purple is curating this show. The foundation for this exhibition was first laid when, as a youngster growing up in a developing neighborhood, Purple and her sister would wander through unfinished homes, imagining what they would be like when finished. “My sister grew up to become an architect,” Purple said, “and it was through her – and that architectural eye — that I began to notice and appreciate the raw materials even more for their own aesthetic beauty.” A gift from her sister of found materials from a construction site helped galvanize the idea for The Art of Construction. 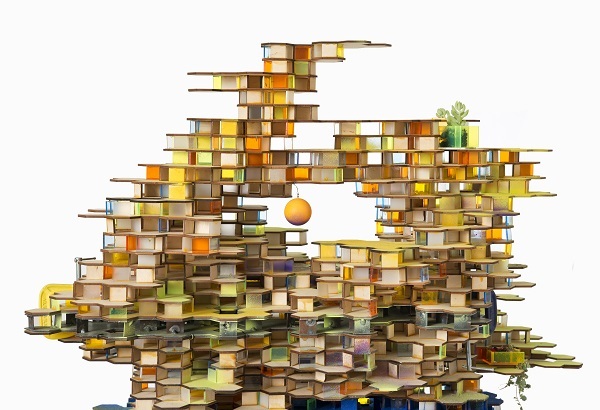 Above image credit: Susan Meyer, House of Windows (detail), 2014, wood, acrylic, steel, flocking, hardware, succulents, toy deer, 60 in. X 36 in. X 24 in., courtesy of the artist. What better place for an art exhibition about water than at a Museum on the banks of a river? The exhibition will focus specifically on rivers Wengenroth painted in Sussex County, New Jersey. Wengenroth holds a special connection with this section of New Jersey. Before joining the military, he enjoyed idyllic summer days in a simple wooden cottage built by his German immigrant grandfather on Culver’s Lake in Frankford Township. Years later, work brought him to Manhattan, but he never forgot that rural oasis in northwestern New Jersey. 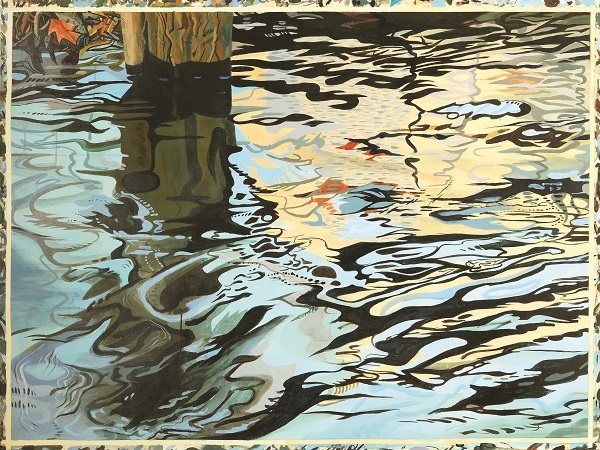 Above image credit: Richard Wengenroth, Autumn Slip, 2014, Acrylic on paper, 44 in. X 59 in., courtesy of the artist. Artist Steve Sitrin makes ceramic vessels for the pure joy of the creation process, and the surprising results his efforts yield. Sitrin works in porcelain with glazes that flow and crystallize when fired. “I take advantage of this movement by creating surfaces where glaze can pool and run,” Sitrin noted. 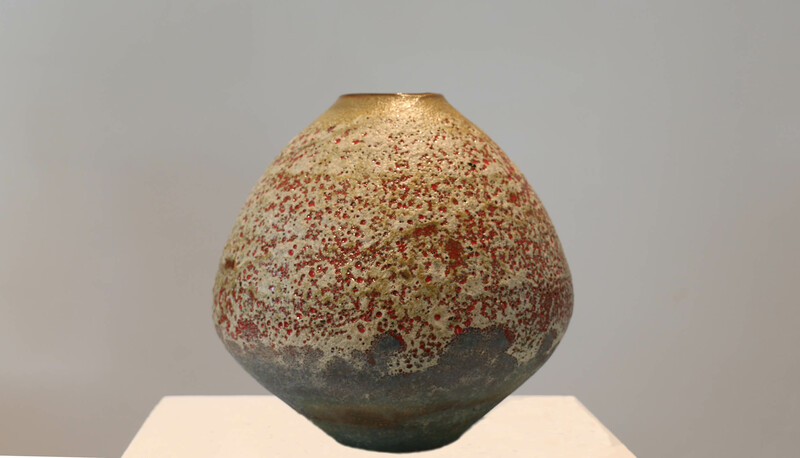 Above image credit: Steve Sitrin, Vessel with Lava Glaze, 2015, Porcelain oxidation fired to cone 7 with lava glaze, courtesy of the artist.